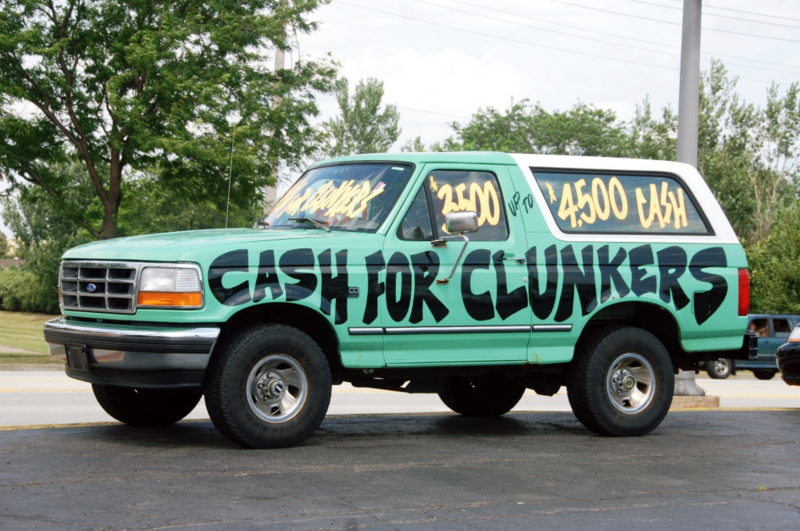 With the benefit of a few years’ time, I can now look back and safely say that the “Cash for Clunkers” (CFC) program was one of the strangest auto-industry events of the past 50 years. Formally known as the Car Allowance Rebates System, CFC might better have been dubbed Cash for Guzzlers, as pulling gas-thirsty vehicles off the road was the program’s primary stated goal. Environmental initiatives weren’t the program’s only goals, though CFC did successfully pull a significant number of low-mpg rides off the street. It’s important to remember that when CFC kicked in on July 1, 2009, the auto industry was weathering a number of brutal storms. Twelve months earlier, national-average gasoline prices had broken the $4-per-gallon mark for the first time ever. Around the same time, the first real warning signs that U.S. automakers were not in solid financial condition appeared. The CFC program touched all of these issues, with the additional promise of cleaning the air, and boosting employment—at least at auto dealerships. The program was simple enough in concept: The federal government would pay people to scrap old, inefficient vehicles and replace them with new vehicles that used less fuel. To this end, Congress appropriated $1 billion dollars to the project. 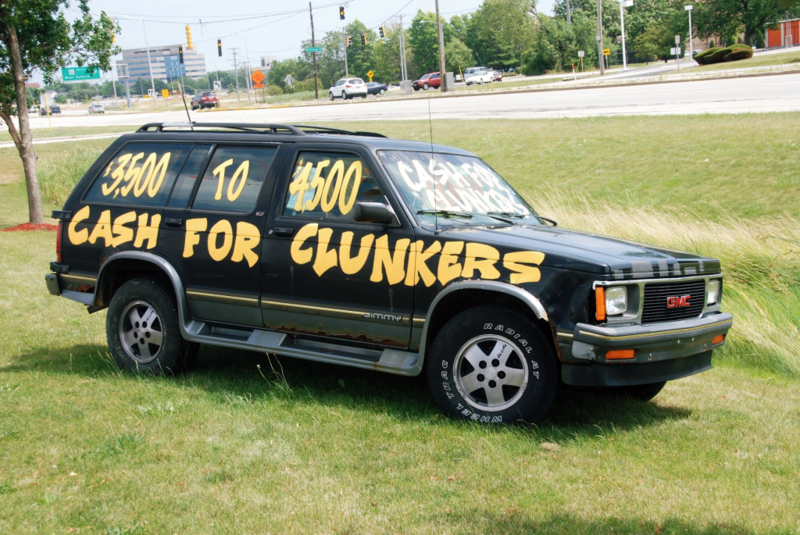 Though Cash For Clunkers was originally scheduled to run through November of 2009, the initial funds ran out by the end of July. Congress quickly added another $2 billion to the pot, which extended operations through the end of August. To qualify for the program, a consumer had to own a vehicle with an EPA city/highway-combined mpg rating of 18 or less. Further, the new vehicle being purchased had to have an EPA combined rating of 22 mpg or more. Consumers were paid either $3500 or $4500, with the amount being determined by the spread in mileage ratings between the two vehicles involved in the deal. This Ford Bronco seems too nice to have been swapped for a more efficient ride. Whether or not CFC was a success depends on whom you ask, and what you believe the program’s real goals were. 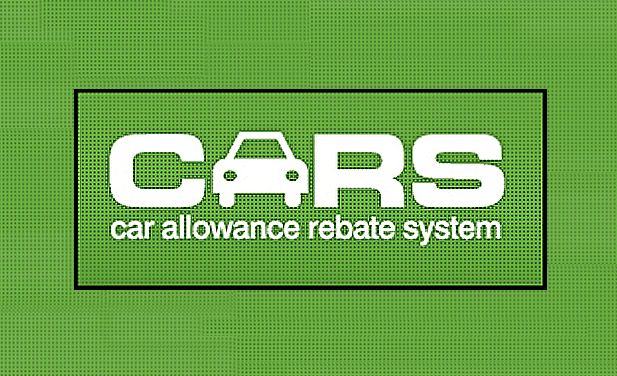 There are plenty of conservative-pundit recaps of the Car Allowance Rebate System that suggest a number of reasons why the initiative was a failure–the most compelling of which asserts that the scrapping of nearly 700,000 vehicles did more environmental damage that would be offset by the net reduction in fuel consumption. 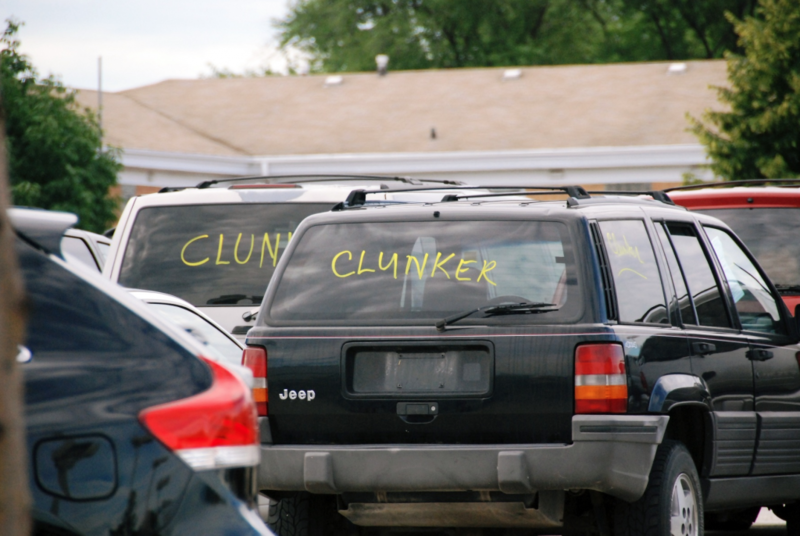 Jeep Grand Cherokees were among the most-traded-in vehicles under the CFC program. That said, the average combined mpg rating of vehicles traded in during CFC was 15.8, while the average mpg rating of vehicles purchased under the program was 25.4—a healthy improvement. One has to assume that consumers who were swapping out of vehicles worth less than $3500 were also trading away reliability headaches as well as large fuel bills. And what of the cars traded in during CFC? Those vehicles were all scrapped. And to ensure that none of those vehicles ended up on the road again, the terms of the program dictated that engine be run until seized. Really. To do this, the oil was drained out of each traded-in car and truck, and replaced with a solution comprised mostly of sodium silicate. Thus treated, the vehicles’ engines were run until they stopped, forever. Shared here are several images taken in the Chicago area during CFC. 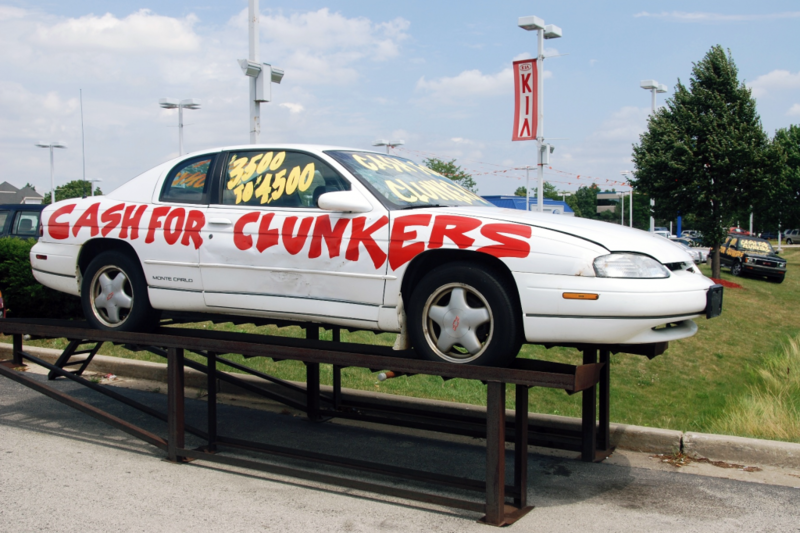 Dealers got colorful promoting the program, making rolling billboards of vehicles destined to be scrapped. We’re at a loss how a Chevrolet Monte Carlo fits into all of this, as the car did not qualify for trade-in under the program. Maybe, being white, it just made for a good canvas. Oh, and if you’ve ever wondered why you don’t seem to see many older Ford Explorers on the road anymore, it’s because they’re not on the road anymore. The Chevrolet Monte Carlo did not qualify for rebate under the CFC program. That said, this car looks ready to be scrapped anyway. Written by: Tom Appel on January 30, 2017.on September 7, 2017.